I don't know about you, but I love waking up in the morning and having breakfast all ready. That's just one less thing to have to worry about when trying to get ready on busy mornings. I especially love individual size portions for school mornings, which make it super easy to feed just one kid - or a whole football team - if you have one. This recipe for Overnight Oatmeal In A Jar is one of my favorite make-ahead morning meals. I really like breakfast casseroles too, they're quick and easy and sure to please the pickiest critics, so I decided to miniaturize it and turn them into these Ham & Cheese Breakfast Cups. You can customize them any way you want - swap the ham for sausage or bacon, add in some cooked veggies or get wild with your cheese. I kept these simple since that's what my kiddo likes best, but I'll definitely be experimenting with some different variations. Just throw it all together the night before, pop them in the fridge, and have them baking while you're getting ready in the morning. Easy and super yummy, this is a great time saver recipe when you need one. Divide the bread cubes into 4 sections and place in 4 ramekins. Place 1/4 cup ham in each ramekin. Then sprinkle 1/4 cup shredded cheese over the ham in each cup. In a medium bowl combine the milk, eggs, melted butter, dry mustard, salt, and pepper. Mix well. Pour evenly between each ramekin. Cover and chill overnight. When ready to eat, remove from fridge and preheat oven to 350 F. Bake uncovered for 25-30 mins or until set and golden brown. Remove from oven and allow to cool and set up for 5-10 minutes. Recipe Note: Your cups will be nice and poofy when you remove them from the oven but will sink a little after cooling. That's o.k! :) The type of bread you use can also change your end result. It's best to use a dry bread like challah, french bread, or any stale textured bread, so your casserole isn't too mushy. I had a hankering for something gooey and chocolaty yesterday. At first I thought brownies, but that didn't sound like it would hit the spot. Then I had another idea - gooey butter cake - but that didn't seem right either. Living in Missouri the ultimate gooey dessert is St. Louis gooey butter cake, and of course since we moved to St. Louis just last summer, I've been well-acquainted with the sticky, tasty treat. Whenever I stroll through the grocery store - because that's how I grocery shop, no wild six year old running amuck through the aisles here. Ahem. Moving on. As I was saying, when on my leisurely grocery trips I always have to avoid the bakery section, namely the giant goody cabinet filled with gooey butter cookies, cakes, and all manner of pure evil deliciousness. Then I thought, why not have a brownie AND gooey butter cake AND throw in some peanut butter, just to be safe. Then why not roll it all up into a cookie while I'm it? That's how I got these babies. Peanut Butter Brownie Gooey Butter Cookies. I was inspired by Paula Deen's Gooey Butter Cookie recipe, since she is the queen of gooey butter cookies after all. She uses a cake mix, but I preferred to start with a brownie base from scratch. These are just as you would expect them. Gooey, chocolaty, peanut-buttery - oh yeah, and really, really good. In a bowl combine the flour, cocoa, sugar, and salt. Set aside. In an electric mixer, combine the cream cheese and butter until smooth. Add the egg, vanilla and peanut butter and mix until creamy. Add the flour mixture to the cream cheese mixture and mix until well combined. Cover and place in the refrigerator so the dough can firm up a little bit. Preheat oven to 350 F. Remove dough from fridge and roll the chilled dough into tablespoon sized balls. Place on an ungreased cookie sheet and bake for 10-12 minutes. Cool completely. The cookies will stay soft and gooey on the inside. Yum! Yesterday was the anniversary of my brother's death. Last year I made these Fresh Cranberry Scones with Lime Glaze, since they're a comfort food for me. Growing up in the U.K nothing says comfort quite as much as a nice "cuppa" tea and a scone. I thought this year would be a good time to make another scone recipe, so I threw in some chocolate chips and added a peanut butter glaze. What's more comforting than chocolate and peanut butter? Preheat oven to 400 F and grease a large baking sheet. Coarsely chop the chocolate chips. In a large bowl combine the flour, 1/2 cup sugar, baking powder and salt. Cut in the butter with a fork or pastry cutter until the mixture resembles coarse crumbs. Stir the chopped chocolate into the flour mixture. Combine the egg, yolk and cream, then add to the flour mixture, stirring just until combined. On a well-floured surface with floured hands, gently pat dough into a 1-inch-thick round (about 8 inches in diameter). With a sharp knife cut the round into thirds one way, then make perpendicular slices the other direction to make diamond shaped scones. Depending on how you slice them, you should get about 10-11 scones. Use your hands to gently shape any leftover scraps into scones. Do NOT roll dough out. Place scones onto a greased baking sheet. Bake for 15-20 minutes or until lightly golden. Depending on your oven you may need to adjust baking time. Remove from oven and let cool on a wire rack. For Peanut Butter Glaze: In a small bowl combine the butter, peanut butter, powdered sugar and milk to reach your desired consistency. Drizzle glaze over warm scones and allow to cool. Enjoy! 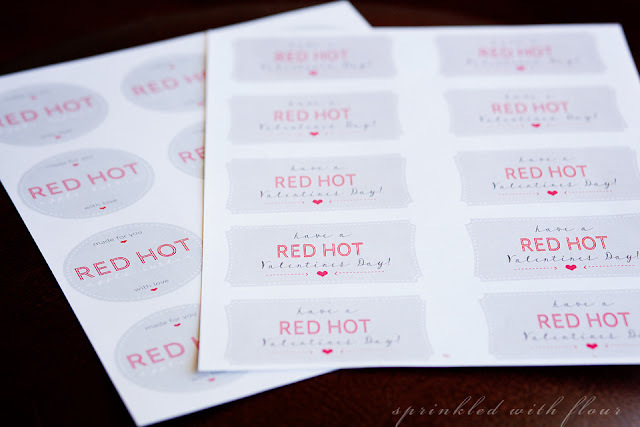 Red Hot Apple Butter & FREE Valentines Printables! When I was a girl I used to love listening to my grandma tell me stories of her childhood. 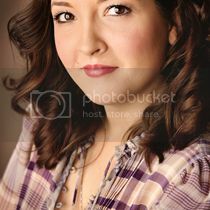 Being one of a dozen children and raised on a farm, you can imagine the stories she had to tell. Certain recipes go hand in hand with memories of my grandma. Fried mushrooms, grape sorbet, and red hot cinnamon applesauce. Yep, putting red hot candies in a bowl full of fresh, delicious applesauce is something that will always remind me of my grandma. When I visited my in-laws this past Christmas, my mother-in-law had a jar of homemade apple butter that one of her friends had made. I love a nice big glob of apple butter the same as anyone, but this apple butter was special. Why? I could tell this apple butter had red hots in it. There was a hint of a little something extra that the average person might miss, but my red-hot trained taste buds picked up the trail like a red-hot loving blood-hound. So with Valentines Day approaching, I decided to start experimenting in the kitchen and see if I couldn't come up with a delicious red-hot inspired apple butter. I love how this turned out. I used a combination of apples to boost the flavor, and a little cider vinegar to give it a great kick. The red hots really do make it just a tad more drool-worthy. This apple butter is great slathered on a piece of toast and even better whipped up in a batch of this Apple Butter Bread with Cinnamon Glaze. Mmmm. I poured some into mini mason jars and packaged them up all purdy for V-day. Who wouldn't want a jar of this red-hot deliciousness for Valentines Day? I plan to give some away as gifts - that's the plan anyway - and if a few jars happen to find their way hidden in the back of my pantry, you won't tell...will you? Peel and core your apples. Place the apples, water, sugar, cinnamon, nutmeg, allspice, salt, and red hots in your slow cooker or a large heavy bottom pot. apples soften. Puree the apples until smooth. I like to use my immersion blender for easy, mess free blending. Add the 2 tbsp of cider vinegar and cook on low for another 8-10 hours, stirring occasionally until mixture becomes thick and turns dark brown. Depending on how sweet your apples are, you may need to use more or less sugar. The general rule is 1/2 cup sugar for every 1 cup of apple sauce. If your apple butter becomes thicker than you'd like, add a little water or apple juice to thin it out as desired. Now how about a freebie! Who doesn't love FREE stuff? I decided to share the Valentine love, and put the labels into a handy dandy PDF printable for ya. 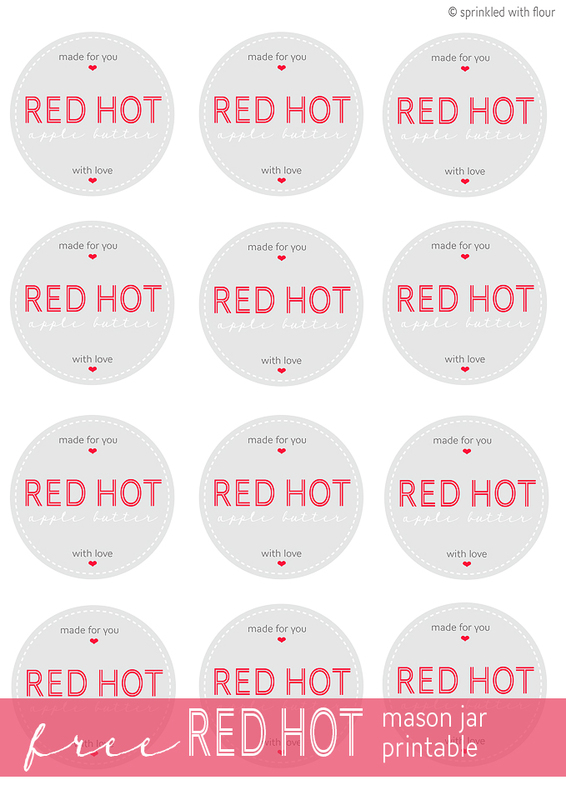 Red Hot Apple Butter Printable labels. PDF download here. 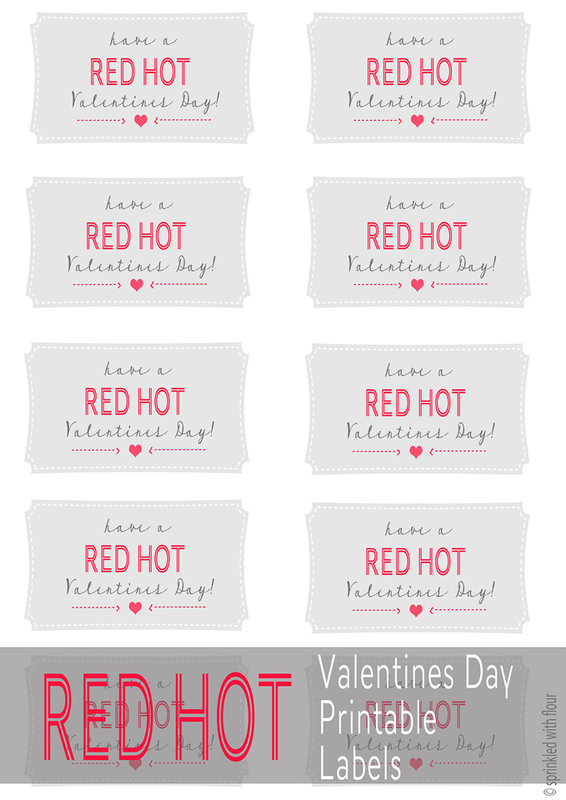 Red Hot Valentines Day printable labels. PDF download here. If you enjoyed this recipe you may also like Apple Butter Bread with Cinnamon Glaze! This post is for all my fellow mothers of boys. I'm pretty sure that mothers of boys - let's call us M.O.B's for short - should have our own special national holiday. Seriously...complete with marching band and waiving banners applauding us M.O.B's for the craaaaazy crap we deal with on a daily hourly basis. Case in point: here are just a few of my Facebook posts recently. Um...yeah. So that's my kid. I don't have girls, but I'm pretty sure girls don't run around urinating on their own faces and sticking their tongues on any random object that happens by. Buuuuuut, I kinda sorta love him and all...so I overlook his 6 year old neanderthal instincts, and on days when I think I'm going nuts - I dive headfirst into a tasty treat. Like this Apple Butter Bread with Cinnamon Glaze. It's moist, spicy, and a great way to forget that you birthed a child who pees on his own face. If you're feeling extra motivated, you can even make your very own apple butter with my recipe for Red Hot Apple Butter. Enjoy! In the bowl of an electric mixer cream the butter and brown sugar. Add the egg and beat well. In glass measuring cup combine the buttermilk and baking soda. Set aside. In a separate bowl, mix together the flour, cinnamon, nutmeg, and allspice. Add the flour mixture to the creamed mixture alternately with the buttermilk mixture, beginning and ending with the flour. Stir in the apple butter and chopped pecans. Pour into a greased 9-in x 5-in x 3-in loaf pan. Bake at 350 F for 1 hour and 5 minutes, or until a toothpick inserted in the center comes out clean. Depending on your oven, you may need to cook for more or less time. Do not over bake or your bread will turn out dry. Cool in the pan for 5 minutes, then remove to a wire rack to cool completely. For the Glaze: Mix together the powdered sugar, butter, cinnamon, vanilla, and enough milk to reach your desired consistency. I usually use 1-2 tbsp. Drizzle over the bread and allow to cool completely. If you liked this recipe you may also enjoy my Red Hot Apple Butter! Can you ever have enough chocolate cake recipes? That's stupid question...right? Well, since we've got that cleared up, how about I share a really good chocolate cake I recently tried out. I have no idea why it's called that, but I do know I can't keep it a secret from you guys, because it's too good a recipe not to share the chocolate love. I found this cake recipe on Tasty Kitchen, and was immediately intrigued by the title, plus it had no picture with it. How can you not be curious about a mysterious dish called Secret Cake, made all the more mysterious with no picture to put with the name. The cake is really moist and fluffy, but the kicker for me was the icing. It was so satiny and smooth, and ultra rich...and was made even better with chopped walnuts folded in. It set up with a slight crackled glaze but stayed gooey and rich underneath. Chocolate heaven! Have I peaked YOUR interest now? 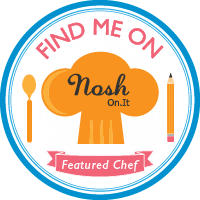 For the recipe and my full step-by-step post, head on over to Tasty Kitchen where you can grab the printable recipe too! Are ya still a bit bloated from all the game day face stuffing? How about a tasty recipe full of veggies to even it out a bit? Oh, okay...this recipe does have it's fair share of melted cheese, so it's technically not HEALTHY per se....but let's just say the veggies cancel out the cheese. Good. I'm glad we agree. I opened my fridge today and came face to face with a sad little jar of my leftover Slow Cooker Chipotle Enchilada Sauce. It was staring at me...all lonely...saying, "eat me." What? Like you don't ever talk to the inhabitants of your fridge? There wasn't enough left for a meal, and just enough that I couldn't throw it away, so this girl got to experimenting. A few butchered veggies later and I'm chomping away on what I like to call the Open Faced Enchilada Veggie Quesadilla. 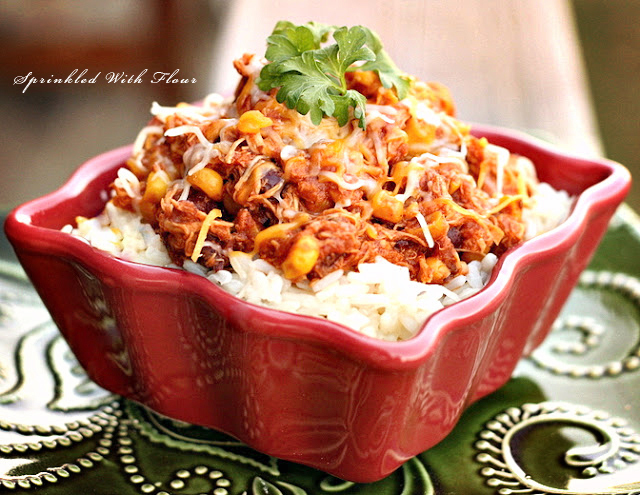 A layer of smoky chipotle enchilada sauce topped with caramelized onions, sauteed veggies and melty cheese, this is another great way to use my Slow Cooker Enchilada Sauce. Cut these up into individual slices and you've got yourself a great appetizer too. Hmmm...I think I know what I'm adding to next year's Superbowl menu. Preheat oven to 400 F. Place tortillas on a baking sheet, lightly spray with cooking spray and prick all over with a fork. Bake for 5-6 minutes, until they are puffed and begin to turn golden. Remove from oven and allow to cool. In a large skillet, heat the olive oil over medium heat. Add the sliced onions to the skillet, season with salt and pepper to taste, and cook over medium-low heat, stirring occasionally, until onions turn translucent and begin to caramelize (about 8-10 minutes). When the onions are almost done, add the diced peppers and cook just until they begin to soften. Remove from heat. Spoon about 1-2 tablespoons of enchilada sauce over the baked tortillas. Top with the onions, veggies, diced olives and cheese. Place back in the oven and cook for 5-6 more minutes, until the cheese has melted. Remove from oven and garnish with fresh cilantro and sour cream. Enjoy! Linked up to What's Cookin Wednesday from Buns In My Oven. Hello. My name is Amber...and I'm a procrastinator. If you're afflicted with this disease too, then pull up a chair and stay awhile...you're in good company. If you're a fellow procrastinator then chaaaances are you've put off deciding what to make for your superbowl party until now. Don't worry, I've got you covered. 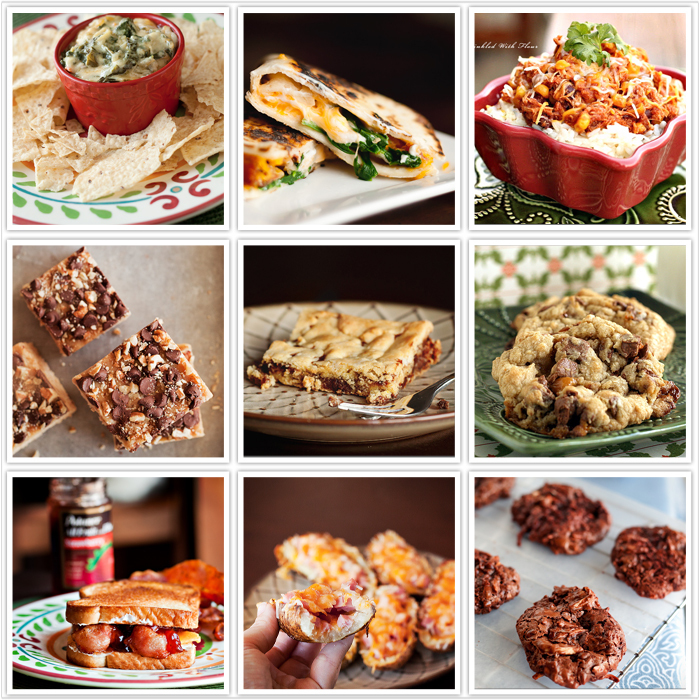 Here's a few superbowl food ideas from the archives to get the ball rolling...and several more drool-worthy ideas from my foodie friends. Need some appetizers to kickstart your shindig? (pun intended). Then these Ham and Cheese Potato Skins should do the trick. Or my favorite spinach dip ever. Creamy Spinach Artichoke Dip. Yum! Need something a little more filling? Cheesy Spinach and Bacon Quesadillas. Mmmm...melty cheese. Do I need to say more? Want something you can throw in your crockpot and not worry about? 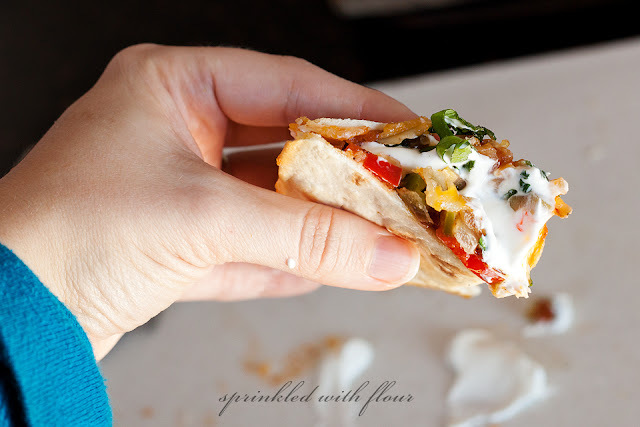 I love this Slow Cooker Chicken Taco Chill. Now onto the good stuff. Dessert baby. These Chewy Gooey Chocolate Bars are everything they sound like they should be. 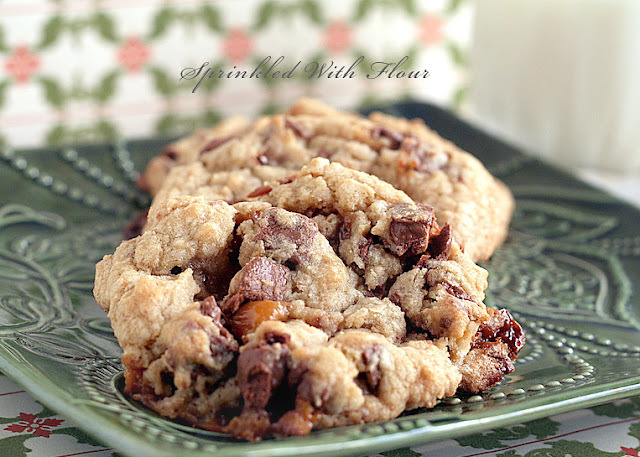 My Chunky Twix Cookies are the most popular cookies I've created, and are widely requested by my family on a regular basis. They've even made it around the blogging world quite a bit. Taste one...and you'll be hooked. Want something super quick and easy. Then you'll need these Turtle Rice Crispy Treats of course! A good sandwich goes a long way, like this Grilled Bacon Strawberry Peach Sandwich. And how about a little bit of gluten free chocolate goodness for all my gluten free peeps? Flourless Chocolate Coconut Almond Cookies. And because I'm a liiitle obsessed with buffalo sauce...and I haven't shared any buffalo recipes yet (gasp), here's a few of my favorite ideas from some of my foodie friends. Go check them out, and have a great superbowl party! Layered Baked Buffalo Chicken Nachos courtesy of Jessica from How Sweet It Is. 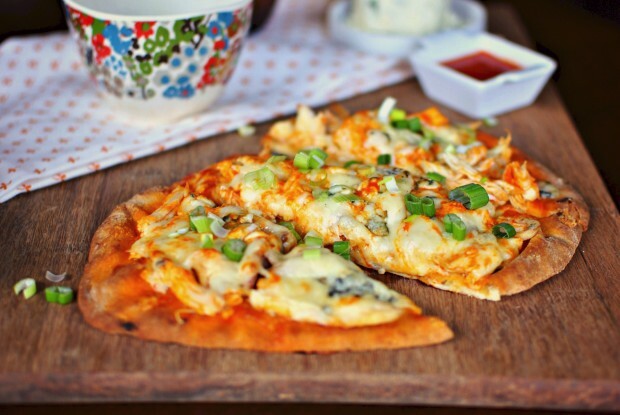 Buffalo Chicken Flatbread Pizzas courtesy of Laurie from Simply Scratch. 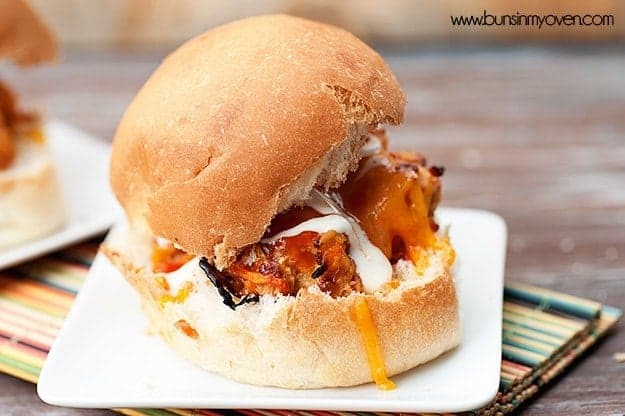 And last but certainly not least, Buffalo Chicken Meatball Sandwiches courtesy of Karly from Buns In My Oven. I hope this has given you enough ideas to get you started...I know it's got my belly rumbling. Do you have big plans for the game, or are you taking it easy? We're just going to be chillaxin it at home. Later!